Williams Park Pond in Eastbourne is surrounded by large established trees and has a small island at one end. There is a walking track on the hillside and a tar sealed driveway on the other side. The park has a café and a beautiful grassed area for public use. The trees surrounding the pond have large sea birds nesting in them and these birds, along with the various species of ducks and gulls, provide a rich and constant supply of nitrogenous fertiliser to the small pond. The pond has a firm clay base and is 1200mm deep. Previously, Hutt City Council had drained the pond into the sea and flushed the sludge away with it. This was a difficult and time consuming practice that was very disturbing to fish life and is no longer an approved method of cleaning the pond, as the discharge was too contaminated to be sent directly out to sea. 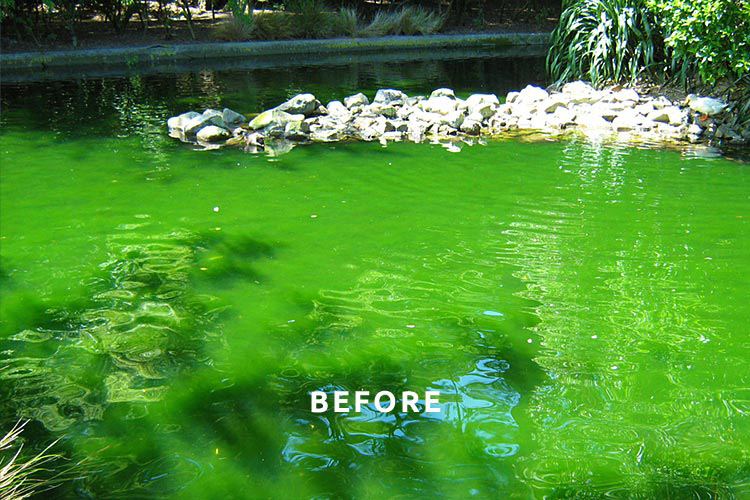 Before Parklink started treatment, the pond would regularly turn anaerobic in summer, with an unpleasant smell. The algae growth was predominantly Filamentous and sat in large mats extending from the base to approximately 200mm below the water line. It was difficult to see any fish life, although it was known to be there and the water usually looked like green soup. 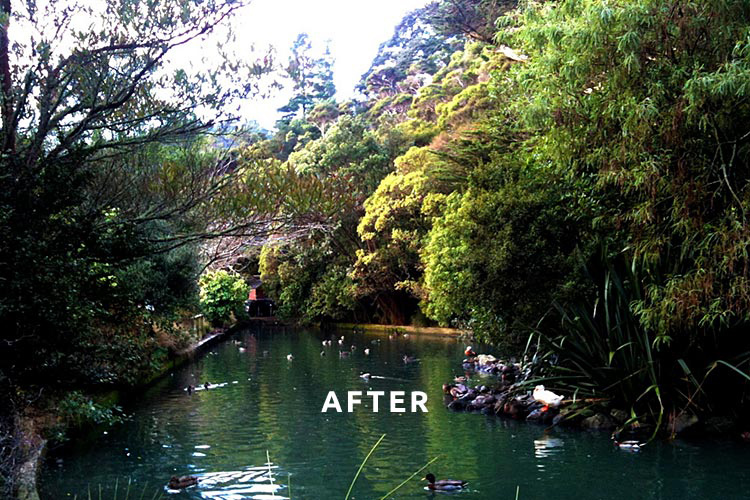 Parklink’s treatment programme began in 2011 and the pond’s condition improved dramatically in the first three to four months, with the water turning crystal clear. Within the first 12 months, the filamentous algae had reduced in depth and was about one metre below the water line, dark green in colour indicating that its supply of nitrogen was being successfully controlled by the treatment. The water quality has remained stable and very clear and clean, with fish life visible. There is no odour and no requirement to empty the pond for cleaning while the treatment continues to keep the nutrient status of the pond in balance.